I’ve put together some short sampler books for FCBD, unfortunately there’s no local comic shops I can take them to. 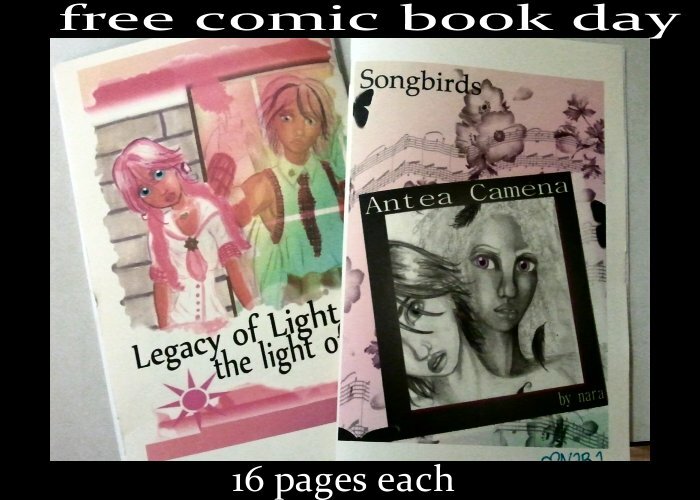 So I’ll be mailing them out and posting a free .pdf to my lulu shop. To get a book let me know that you want one through email, twitter, tumblr, facebook, carrier pigeon, etc so I can get an idea of how many to print by this Thursday. Then I’ll mail them out Saturday. Due to the cost of postage this is for the intercontinental U.S. only. Quantities are limited, but I don’t see getting more than a few orders. Also request if you want the Shojo or Boyslove (a.k.a young adult gay romance) sampler otherwise you get both.